Botanical gardens are institutions holding documented collections of living plants for the purposes of scientific research, conservation, display and education. Botanical gardens may also serve to entertain and educate the public. Sim’s park, Coonoor, came into existence due to the pioneer efforts of the early European settlers. It was inaugurated in December, 1874 due to the efforts of Mr.J.D. Sim, Secretary to Government and Major Murray, acting Superintendent of the Nilgiris forests, and the park was named after the former. Though this was started as a pleasure resort for the residents and visitors, the park has now developed into a Botanical Garden for the purposes of introduction and trial of various exotic species of systematic and economic importance. 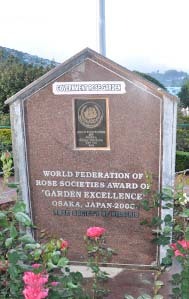 The Centenary Rose Garden is situated in the town of Udhagamandalam in the Nilgiri Mountains in South India, at an altitude of about 7500 feet (2250 meters.) It is on the slopes of the Elk Hills and covers an area of 4 hectares, divided over five curving terraces. The present collections contain 20,000 plants of 3000 cultivars. An arboretum is defined as living collection of trees and other woody plants. More commonly today, an arboretum is a botanical garden containing living collections of woody plants intended at least partly for scientific study , Various tree species of native and exotics are grown in the Arboretum.